This is a #0401 Plastic Sanding Needles Coarse Grit by Alpha Precision Hobby Abrasives. The coarsest needle is perfect for the initial stage of the finishing process and can be used to remove deep imperfections or surface defects. 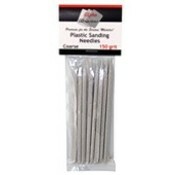 The medium needle, used next, allows crafters to smooth and eliminate the coarser scratches created during initial sanding. 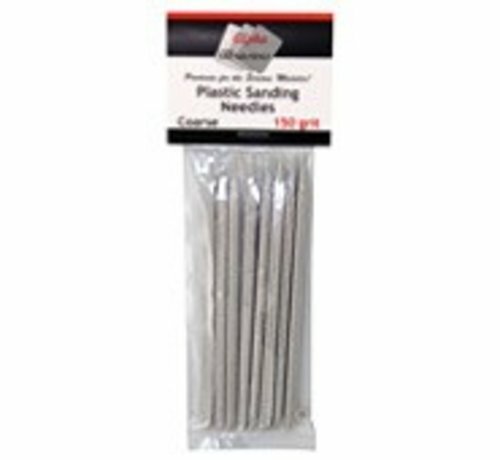 Finally, the finest sanding needle levels and smooth’s providing a delicate touch that prevents excessive material loss during your final finishing stage.